This month Birchbox teamed up with Gossip Girl to create Gossip Girl themed boxes. I've honestly never watched the show nor felt compelled to, so this wasn't really a selling point for me. I didn't feel particularly alienated though, as the boxes were pretty much the same as any other month, nothing really "Gossip Girl-y", as it were. The Birchbox extra was a notecard with XOXO on it, so maybe that's it? Beats me. I sort of knew what box I was getting ahead of time, because 1. I tend to check the possible boxes when they are posted on Makeup Talk and 2. I have received a beautyblender in a previous box, so I figured the odds were pretty high that I'd receive one of the boxes containing a beautyblender cleanser. Considering that some subscribers received Stila eyeliners and Dior mascaras, I was a little underwhelmed. I already purchased a beautyblender set previously so the mini is purely functional, not "woo-hooo, new stuffs to try!" The Color Club nail polish I really do like (if only for my toes.) The gold metallic color is fun and shiny without being gaudy. The Arquiste perfume is okay, better than some perfume samples I've gotten, but it certainly isn't worth $165.00. Gah. A grey Twistband headband...um...yeah. 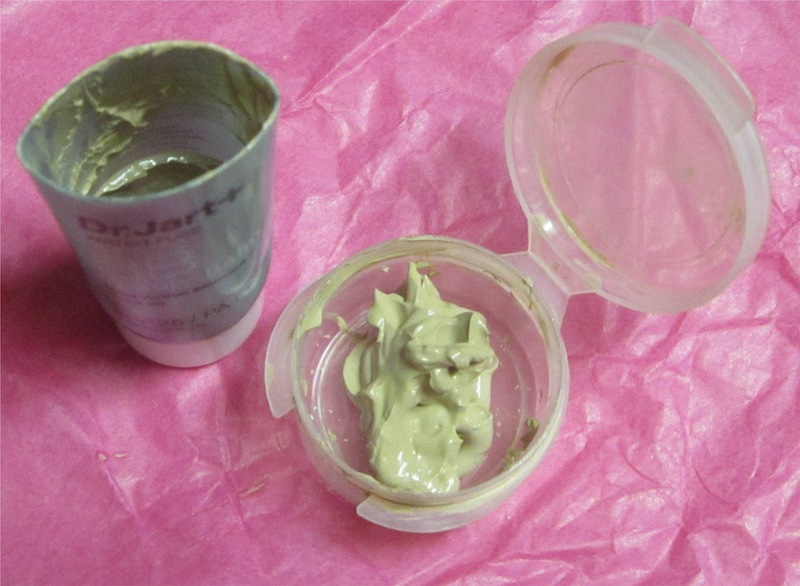 I was looking forward to trying the Dr. Jart Water Fuse BB Cream, but I had heard there was a bit of an uproar over the product tubes. They look big enough to contain a decent sized sample of at least .25 to .33 ounces (common sample sizes). Instead, people were finding their tubes totally dried-out empty, or with barely any product at all. If you look at the tube closely, however, the sample size reads .06 ounces. That is pretty damn tiny. I was lucky enough to get what I think was the correct sample amount according to the tube, even though it took a long time to get it all out, including cutting the tube open. It really should not have been that difficult. Considering that it was what I perceive to be the "big" sample of the box, the size of the tube in relation to its contents was misleading, and wasteful. That sample size was better suited to a sachet. Many people complained and I believe are getting replacements, but I decided not to since I did get a tube with enough to sample a couple times. Not ideal, or what I expect from Birchbox, but not really worth the hassle of fighting it. I think the error in this mostly lies with the supplier. With a lot of effort, I got a sample size a little less than a standard Sephora sample-size clamshell container. Which is a shame because I've used it once, and actually do like it. The other BB creams I've tried have been too dark/orange, felt too greasy, or did not have any coverage. 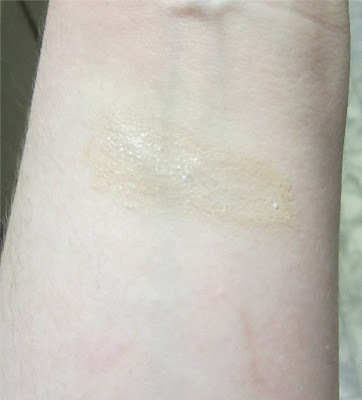 This was close to my skin tone and while I still had to use concealer, gave decent coverage. I probably won't get this in full size, but it would have been nice to get more than 2-3 scant uses to make sure. This box looks pretty good, really. That's interesting about the amount of product in the Dr. Jart tube. 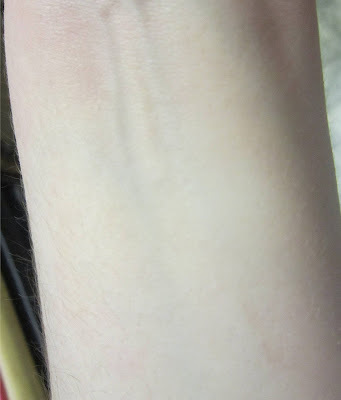 I have a different Dr. Jart bb cream and really like it. Despite the fact that it is too light for me. lol! Maybe I would have been happier with this box had I not been an impatient bugger that always has to peek at what other people are getting. The grass is always greener, you know. Though to me it actually was, I would have loved a mascara or eyeliner. But oh well, luck of the draw. Last month I did get the full size Tarte lipsurgence, so I *try* to keep it all in perspective. 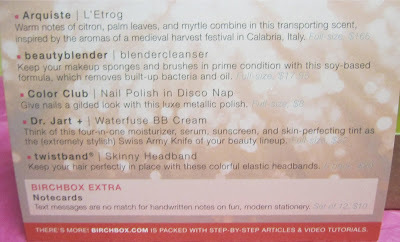 I wanted to get this Birchbox as I'm a Gossip Girl fan. I was disappointed they didn't ship to Canada, but seeing your review I feel better. The box is meh in my opinion. Other than perhaps the perfume (which is the only item I'd be crazy about, as I visited the website and it sounds delish) being expensive and luxe, I don't see how the box relates to Gossip Girl. Haus of Gloi- Summer Starts Tomorrow!